My first Pinterest inspired project! 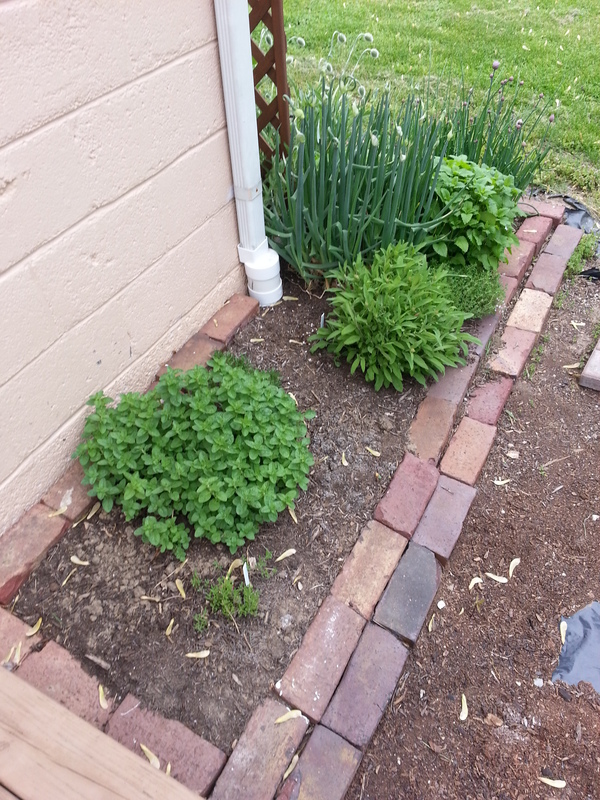 So in 2012 we put in an herb bed on the south end of the garage (see pic at right). We thought this would be a good location since it would be close to the house – and for the most part we were right. However, we underestimated how big the plants would get (regardless of the hot summer) and before you knew it they were growing into each other. In the fall we experimented with various methods of drying herbs and packaged more then a year’s worth of seasonings in the freezer. It was a great experiment and when some of the herbs lived through the winter, we were forced to rethink the herb bed since we wanted to try some new kinds like tarragon, parsley and cilantro (technically we grew this in 2012, but it didn’t do very well). We agreed that we didn’t need two types of basil, so we just got some starts of traditional basil this year from a friend and left it at that. 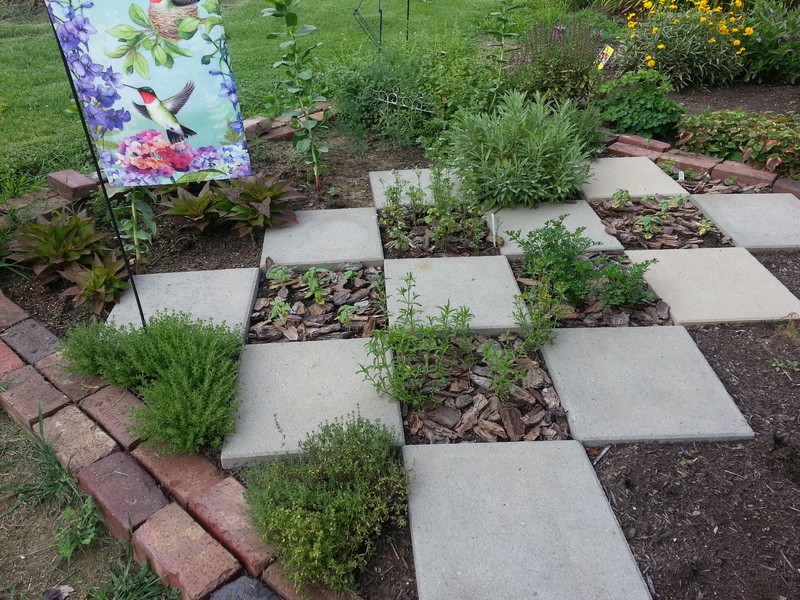 In the meantime, during one of my late-night Pinterest sessions (cause we’ve all been there from time to time) I came across this use of stepping stones and herbs. ‘oh what a fun idea’ I thought and went to bed and …promptly forgot the whole thing. A couple weeks later, Mom and I were discussing the flower bed and the square area that had the porch swing last year and large container plants on stepping stones. With the swing on the deck and not as many container plants to put out…we had stepping stones with no use. LIGHTBULB MOMENT! We placed the stones on a diagonal to the edges of the mulch bed and they fit perfectly! What luck! This left us with 6 large squares, 4 triangle areas and one large space for planting. The picture at right is early July. The large area in 2012 contained oregano, thyme and coxcomb flowers. 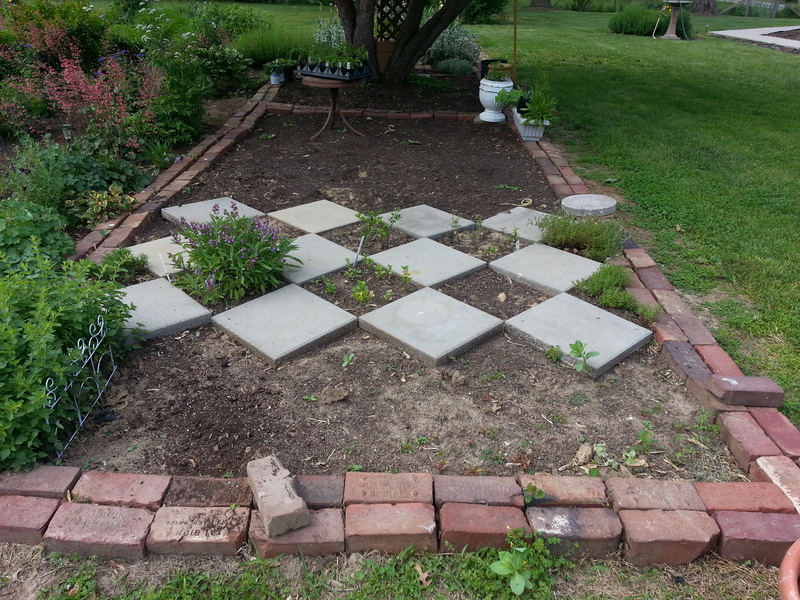 We moved the thyme into one of the triangle spaces and left the oregano in the large space to be joined with dill and cooler/longer growing crops such as leeks and garlic in the late summer/fall. The coxcomb were left to grow and transplanted later. 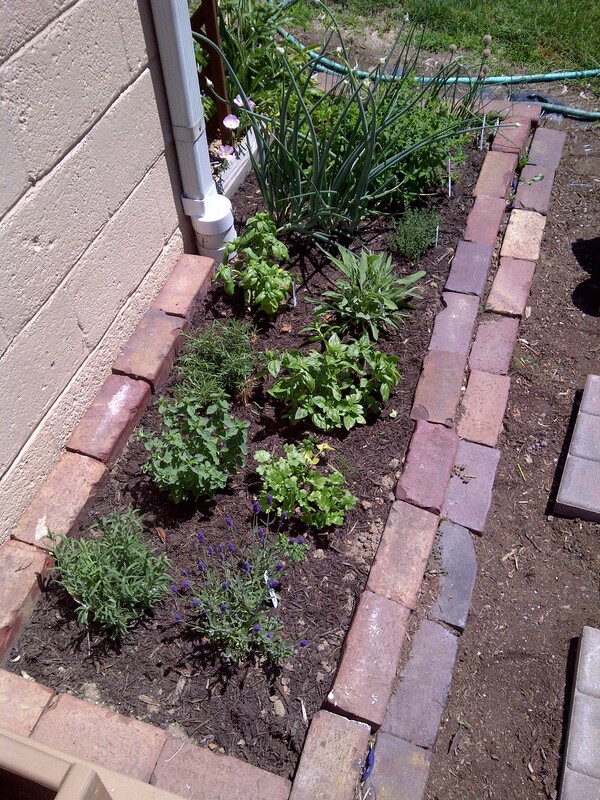 So the large squares hold: Sage, cilantro, basil, tarragon and flat leaf parsley. Small triangle spaces on the ends hold: Thyme (traditional and German), curly leaf parsley and rosemary. Picture at right is from early August. You can see the leeks coming up in the far section of the bed and the dill is going strong. Have to keep an eye out for caterpillars though! The garlic we planted didn’t make it, will need to plant more established plants next year. But what of the old bed you ask? 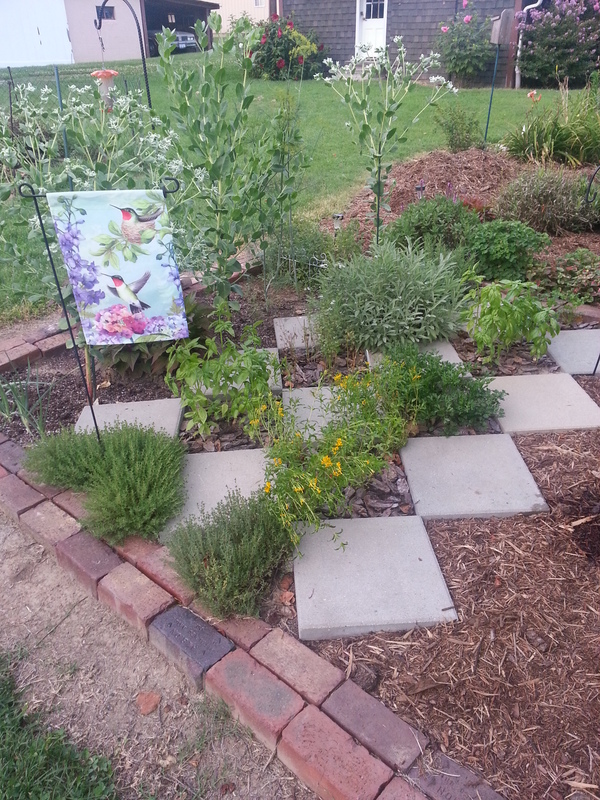 It still has some herbs, such as lavender, another oregano plant, bunching onions, lemon balm and chives. These all survived from last year and we decided not to move them this year. Along the back we planted some spare gladiola bulbs to add some height and color later on in the summer. Next year this bed, based on what plants winter over, will not have the oregano and lemon balm. They will be added to the rest of the herb bed. New Look & New Name! I changed up the look of the blog and finally – a unique domain name!!! How exciting!!! Being a single lady and a HUGE Jane Austen fan, this puts into words the love/hate relationship I have had with the illusive Mr. Darcy over the years. It was a good week for Jane Austen fans. After 97 episodes of the Lizzie Bennett Diaries airing over YouTube for nearly a year, fan girls finally got their opportunity to squeal in delight as Lizzie Bennett (played wonderfully by Ashley Clements [@TheAshleyClem]) and William Darcy (played expertly by Daniel Vincent Gordh[@Danielvgordh]) finally kissed in Episode 98. On personal note, aside from this bit of escapism and an uncharacteristically good Wednesday, the week mostly sucked. It’s partially my fault; I let something consume me that a lot of other single women allow to preoccupy them as well. I’m talking about that particularly vexing part of the dating scene: the promised call from the guy you’ve seen recently that never comes. These may seem like two unrelated events aside from timing, but trust me – there is an important connection. Stay tuned. Spring is in the air! 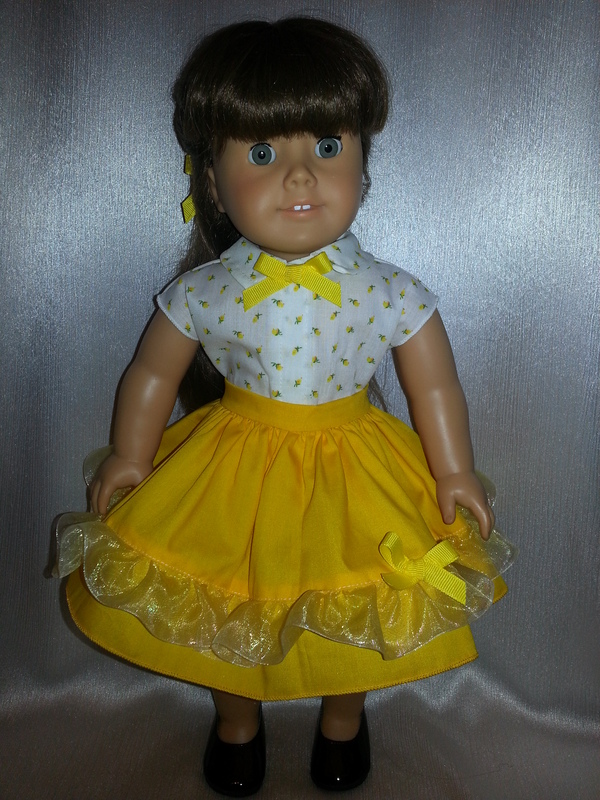 And apparently yellow as well. I had a lot of fun making some fun Easter dresses last week. After going to the mall over the weekend, I have some additional fun colors/pattern ideas I want to put together! I know what you’re thinking – OMG where did you get a round container for baking soda with a LID! For the casual and pro baker – the idea of a baking soda container that doesn’t close tightly has always baffled me. Love the baking powder container with not only a lid but a leveler included on the top! I thought I had found the answer with a round plastic container of baking soda found at the store. But alas, it was not to be. So I continued on till I moved in with mom and we had two canisters of baking powder. This is mind-numbingly simple. 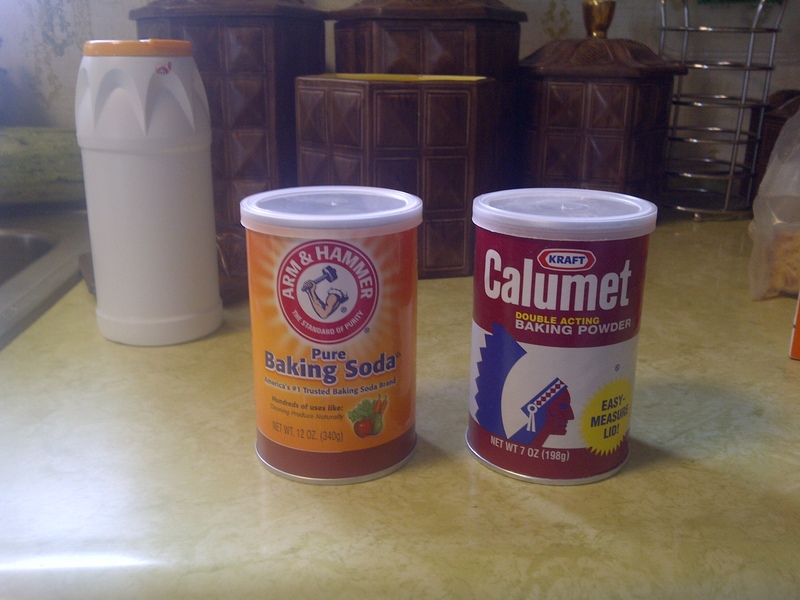 So when my tall plastic baking soda canister (pictured at left) ran out, I removed the label. Once you have an empty baking power container (which I will admit, takes a long time to use), clean out the best you can and then wrap the baking powder label around it. Seriously, it is a perfect fit. Then buy a new container of baking powder and a small box of baking soda. Using a funnel, the small box will fit nicely in your new container. What if you buy a big box? No worries, just fill as normal and place the rest in the fridge to absorb odors.